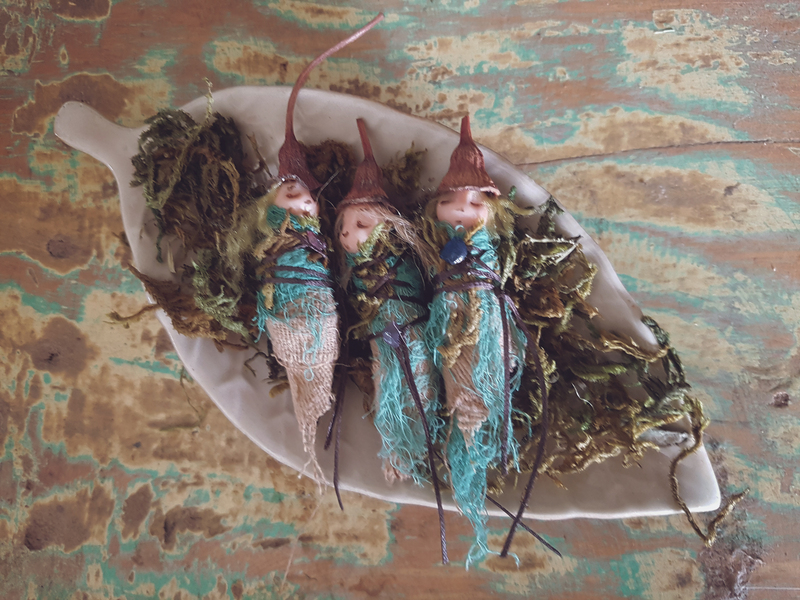 There are so many DIY crafts online these days (thanks pinterest!) 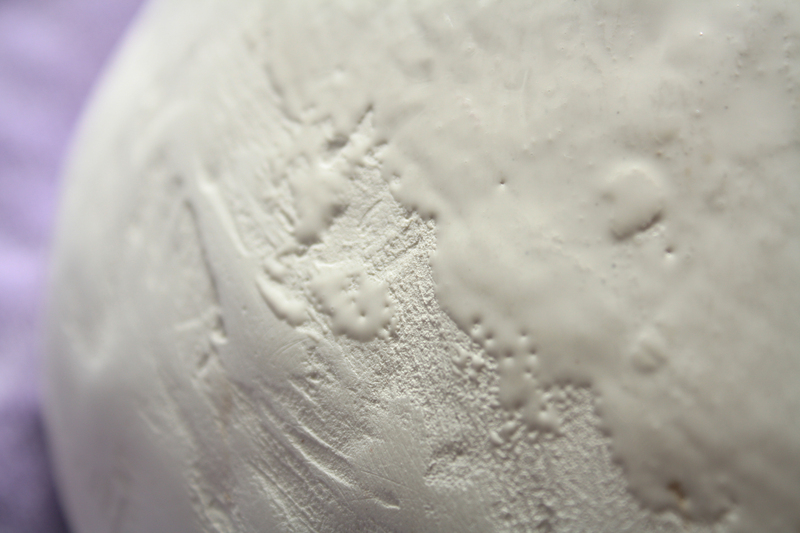 that when I needed some gesso for a project I thought ‘Hey.. maybe I could just make my own?’ And sure enough, I did. It’s really easy to make, dirt cheap and most likely just using ingredients you have at home anyway. I took pics as I went so I could share this grand discovery. Water, PVA glue and talcom powder. 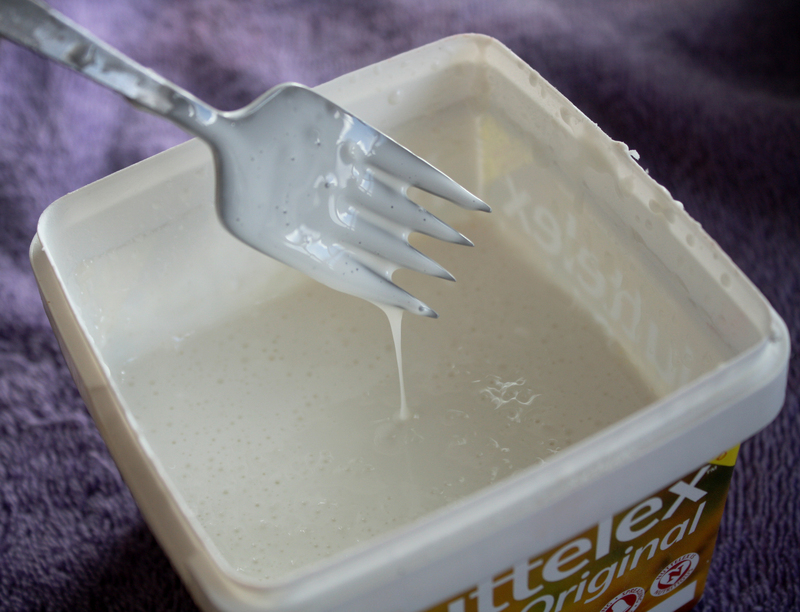 It also helps to have a container to mix it in, a stirrer (I started with an old paint brush but later swapped to a fork) and an applicator. 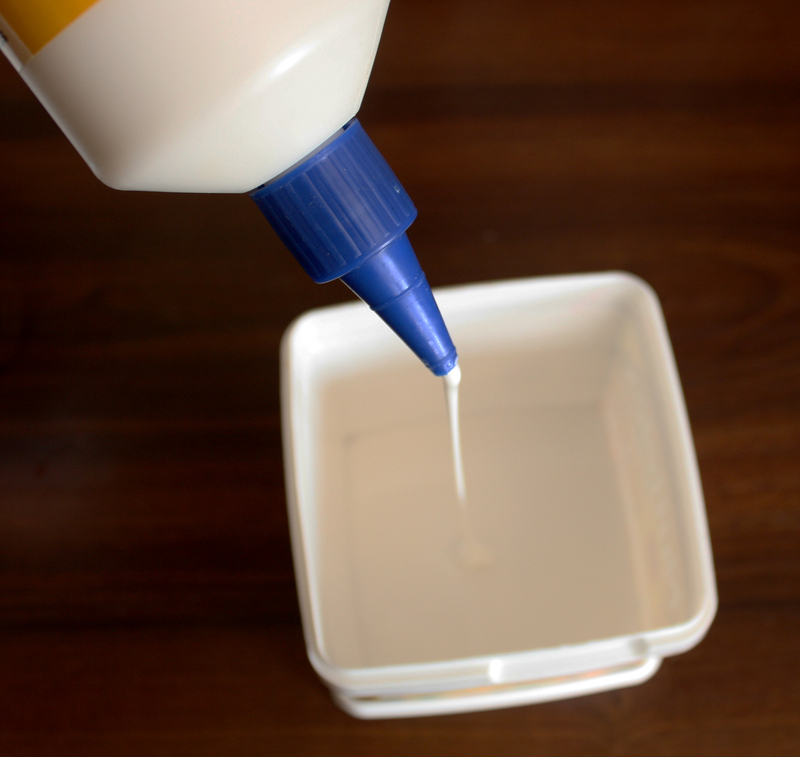 Mix 1 part PVA glue, with 2 parts water. Mix it good. Add talcom powder. Note: This can get messy if you attempt to do it my way. 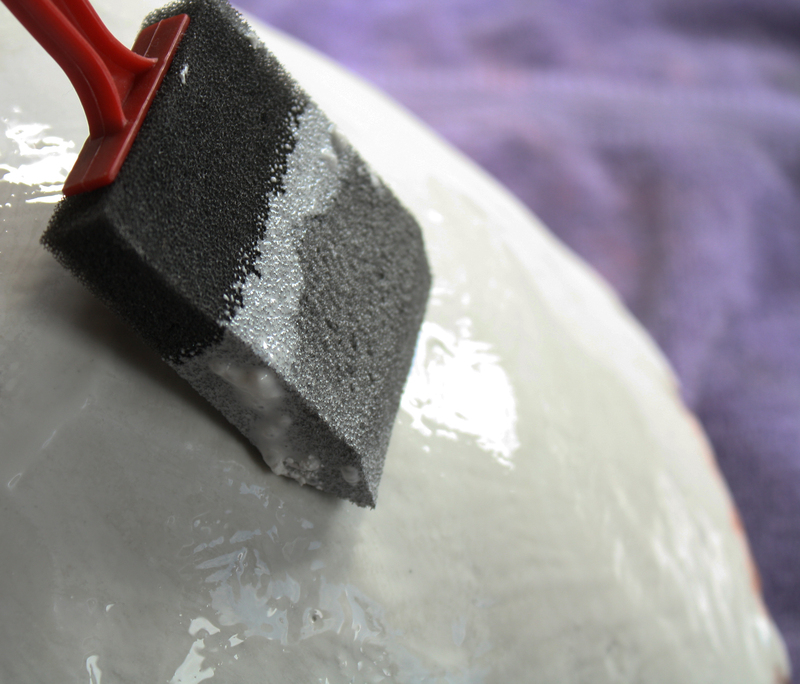 By squeezing the powder straight into the mixture, it creates a big puff! Be gentle.. I read a few recipes that all had different quantities of powder, so I just added small amounts at a time. You want to achieve the consistency of pancake batter. My mixture had lots of little lumps in it which is why I stirred with a fork in the end. A whisk is probably a good idea.. but the fork worked fine. Stir all the lumps out and you’re ready to rock. I applied about 3 coats and let each coat dry in between. Once complete it must be left overnight to dry before sanding. I had plenty of mixture left over so I poured it into a jar to keep for next time. Gesso is often used on canvases as a primer. Once dry it is sanded back to create a smooth, absorbent surface to paint on. For my project I am applying the gesso to a rough plaster dome in an attempt to fill the ridges. I’m going to have to find something to use gesso on! Never heard of it before. Great post! Oh it’s great stuff, especially for preparing canvases.. it’s pricey too so glad I found this way to DIY! At university we applied it to hardbord, and it works perfectly. You can apply it to the smooth or the rough side. The rough obviously has more grip/bite. is it used as a acrylic medium? I haven’t used it as a medium before but you could experiment and see what happens! I’m sure it would work but because it’s white it will change the colour of your paints. I use it as a base for texture or sand it to make a smooth surface. As a medium, maybe not a good idea, but you can work on a gesso surface with acrylic and oils. It’s also a great recipe to use as a texture paste. Add a little less water and make it about the consistency of toothpaste. Using an old credit card or a palette knife smooth it over a stencil to make a raised design. This is an awesome recipe – very versatile. Thank you!!! Genial !!!! Yo en vez de talco agregó polvo tiza !! Será lo mismo ??? Me da resultado y es mas barato todavia !!! Pruebenlo !!! El q sea mas espeso o líquido va a depender lo q desees hacer y la textura final q desees obtener !! ¡El polvo de tiza es una gran idea! Debería funcionar bien, gracias por la idea, lo intentaré. / Chalk powder is a great idea! Should work well, thanks for the idea I will try it. At art school we used plaster of paris and linseed oil, and stirring it up to a completely mixed consistency took all day!! They probably chose that method to keep us in the studios! But, the end product was, and still is magical. It takes forever to get to the end, but the outcome is like nothing I’ve ever tried instead. It has been the preferred method at my alma mater for decades. All the well-known artists who went on to fame and fortune, used it and swear by it. But this method has merit. 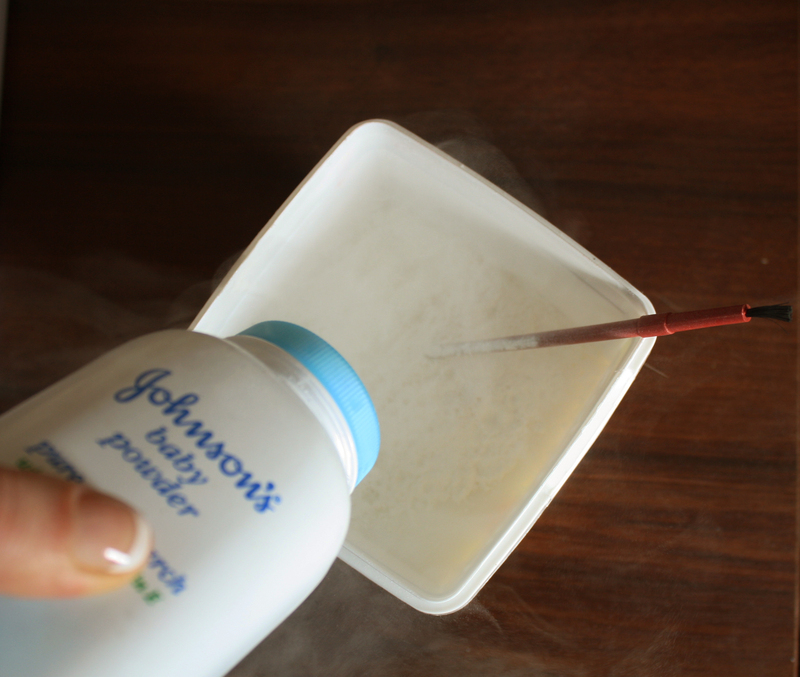 You say “Talcum Powder” yet the bottle of baby powder in the photos is the “Cornstarch” type. SO which is it? Hi MikeB, that’s a good question. Short answer is both. You can use either. In the recipe the soft white powder is used to hold everything together. The recipe I was using used talc and I used baby powder which had the same result.